Serving many parishioners, as well as supporting our pre-school, day school, psr, and adult faith programs, as well as offering our parishoners sacramental services, St. Gabriel is a thriving, active community. Do you have a specific question or comment? Not sure whom to contact? Feel free to contact the parish office, or use our online contact form, and we will respond to your e-mail. Our door is always open. Feel free to contact our pastoral and supportive group for any questions or concerns that you might have. The Evangelization Committee of St. Mary Chardon and St. Gabriel work together to strengthen the Evangelization for faith, and work together to help the followers of Christ. Learn about the history of St. Gabriel and the many changes and developments that have occured over the past years. With the support of our parishoners, we have been able to sustain and grow. See our list of accomplishments! ​St. Gabriel is the patron saint of our parish. 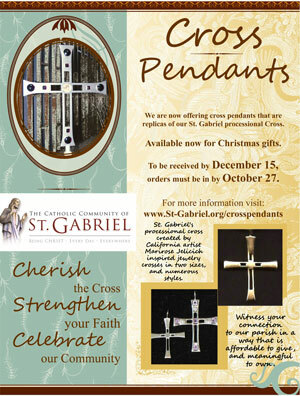 We are now offering cross pendants that are replicas of our St. Gabriel processional Cross. Available now for Confirmation, Easter or First Eucharist Gifts.